I’m currently working on a iPhone version, I think after this I’m just going to try to polish the various apps I have. 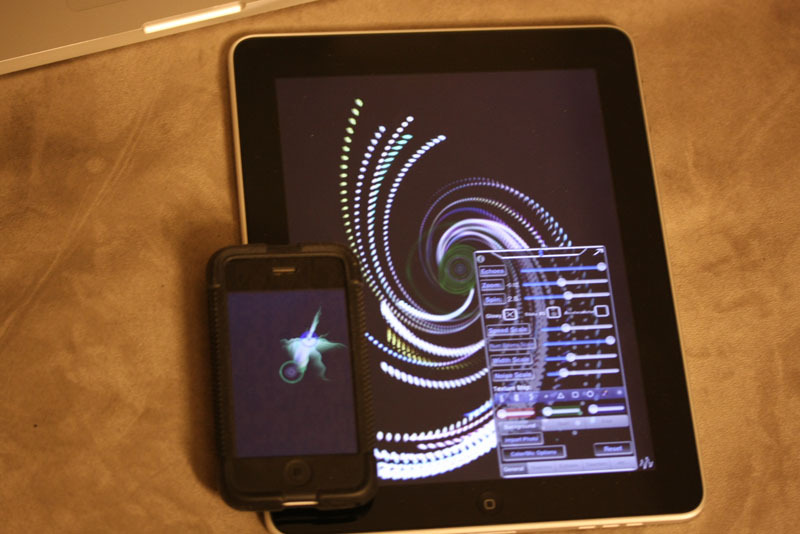 Taking all the crazy tech I built for iBeams and I’ve leveraged it into a pretty cool particle play app. 4000 stars appear in various shapes, touches can blow apart and restore patterns and I’ve seen a bunch of really gorgeous creations. Initially I was a bit worried about just spitting out another spawn/gravilux/gravitarium clone. But I think it’s got a lot of interesting functionality that they don’t. I downloaded your Gravilocity iPad app. I love it. I have no need for a therapist now. Stressed? I just open up your app. *smile* The app is wonderful. I’ve had a chance to play with all the settings. Well done. Recently Apple featured a really simple openGL app, Something that was being marketed as a installation piece back in the 1990’s. Beyond rendering setup this app required about 20 lines of code (provided you had a xyz vector class) . Someone quickly copied this app and made it free, now the original is being sold for 2 bucks and the copy is being sold for a buck. It says something about the fickle nature of Apple’s featured app process that they managed to turn someone’s weekend iPad porting project into tens of thousands of dollars. I took a look at the original and it’s 8000 ratings (implying that it actually sold more like 30-50k copies) and said I can write this in an hour. Of course when I did it, I added a bunch of more modern rendering tricks, and it was inside the iBeams rendering framework so I have echoes stretching off into infinity, and the accelerometer bouncing stars around . I’m currently working on making a simplified UI for it. You’ll have to forgive the lack of audio, I didn’t quite realize that it wasn’t easy to video tape the ipad while holding the iphone. Apple’s biz dev group was kind enough to snag a 32-gb iPad for me after they pretty much sold out around boston. It took a few hours but I think I’ve managed to fix all of the show stopper bugs in iBeams HD, and it looks stunning on the iPad. Frame rate is super smooth, it feels really immersive, and the UI is much less squashed on the device. It was always crazy overkill on the iPhone, but it feels pretty good on the iPad. So thoughts after a few days playing with the iPad; its the ergonomics that drive me nuts problematic, the device can’t comfortably sit on your lap without being propped up, you can easily get a 80 degree viewing angle from a laptop but the iPad really needs to be held. It’s too heavy to hold for long periods with one hand, or at least it makes my wrist act up, and lastly combining the two previous problems, it just feels too big for reading in bed, it’s not like you can bend it like a paperback. All told it feels more comfortable reading a blog on my iPhone then on my iPad. Presumably once I get a decent case some of these issues might go away, but maybe Apple should have gone with a smaller higher res screen and 9 hrs of battery life, (fyi inside the device is mostly battery). I really want a hulu app, and the lack of multitasking and video flash support is annoying, at least give me a multithreaded chat client. It’s rather odd that the iPad support for OS 4.0 has to wait till the fall. It feels like apple has been really picky about their human interface guidelines, they really want you to use popovers and support all orientations. They frequently reject apps for not rotating properly. On the other hand considering Apple was letting people ship out apps on hardware that they’d never seen with an really slow emulator, iBeams HD was getting 5 fps in the simulator making it untestable, they really didn’t give useful feedback like “hey your app crashes when we press X”. Apple you need to have a way to let developer notify you that something is a hot fix for a bug that is upsetting customers. When an app is broken, 4 business days to then bounce a submission because the splash screen doesn’t rotate, is really unacceptable. iPad Developers seem intent to avoid the race to the $.99 bottom. Right now sales are much lower on the iPad, and development cost are higher, although porting existing apps may not be that bad depending on the nature of your application. Heavy use of 3d just rescale the viewport, 2d side scroller… ouch. Games are mostly $5+ but the smaller developers are releasing universal apps that by definition can’t have different price points, so there’s going to be price pressure down as the number of universal apps goes up. I can’t edit this post on my iPad, and I’ve hit a number of sites like zimbra’s mail client and even apple’s developers forums where the keyboard UI fails to register or there is just no way in mobile safari to move the scroll bars. Long story short, what’s forgivable on the iPhone feels a lot more frustrating on the iPad. iBeams HD with a UI built from the ground up for the iPad (cough simulator cough) is now available, even if the devices to run it aren’t get it at the appstore.